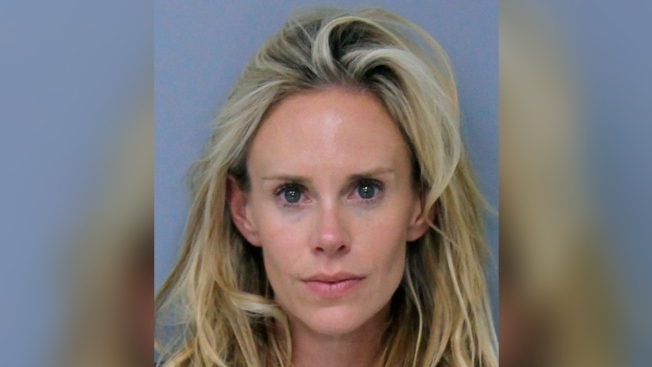 This Saturday, May 12, 2018 booking photo provided by St. Johns County, Florida, Sheriff's Office shows Krista Glover, the wife of former U.S. Open champion Lucas Glover. Glover answered when the St. John's Sheriff's Office in Florida called back and said his wife was lying. "Yeah, hi, I think we got our lines crossed here. This is the husband, the sane one of the bunch," Glover says in a calm voice. "My wife has called you. ... Now she's trying to blame it on my mother, which is not the case at all. ... My wife has gone crazy." Krista Glover was arrested Saturday night and taken to the St. John's County jail. She was released Sunday on a $2,500 bond and faces misdemeanor charges of domestic violence battery and resisting arrest without violence. She has a May 31 court date. According to the arrest report , Glover told the deputy that his wife yells at him, stating he is a "loser" and other choice words, when he plays poorly in a tournament. Earlier in the day, Glover shot 78 and missed the 54-hole cut at The Players Championship. Krista Glover told the 911 operator she had been attacked by her mother-in-law, who had locked herself in her room. When asked how she was attacked, Glover's wife hung up and Glover answered when 911 called back. When asked if the sheriff's office should send a rescue squad, Glover politely said that won't be necessary. The operator then asked if she could speak to Glover's wife. "No, you cannot," Glover says. "She's in the house with my daughter. And when deputies get here, they need to talk to the male — that would be me — because these other two are out of their heads at the moment." When the operator points out that his wife is who called, Glover replied: "Well, she's going to lie to you. That's what I'm telling you. That's why I answered the phone. She's telling lies." According to the report, Glover said his wife began the altercation when he was on the back porch and then began attacking his mother, Hershey Glover, when she tried to intervene. The deputy said in the report she was arrested based on injuries on Lucas Glover's arm and his verbal statements. Glover and his wife have two children, a daughter who turned 5 on Monday and a 2-year-old son. He has three PGA Tour victories, including the 2009 U.S. Open at Bethpage Black. He also has played in the Presidents Cup twice. Glover earned nearly $2 million last season and finished No. 43 in the FedEx Cup. He currently is No. 104 in the world ranking.